GKN Sinter Metals was in the tool-specific components category. Maxon Motor has given GKN Sinter Metals Spa AG based in Bruneck, Italy its 2015 Supplier Award for best overall performance. The award goes to suppliers who excel in quality and delivery reliability in four different categories. GKN Sinter Metals was in the tool-specific components category. Maxon Motor is a leading supplier of high-precision drive systems. The company was founded in 1961 and employs a staff of more than 2,000 worldwide. 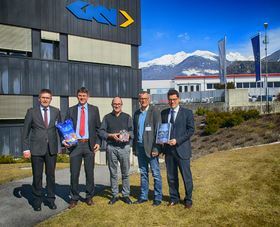 GKN Sinter Metals in Bruneck supplies the Maxon Motor locations in Sachseln, Switzerland and Sexau, Germany mainly with bearings for electric motors and planetary gears and carriers for industrial actuators. This story uses material from GKN, with editorial changes made by Materials Today. The views expressed in this article do not necessarily represent those of Elsevier. GKN Sinter Metals has received the Best Supplier Award by Somfy.